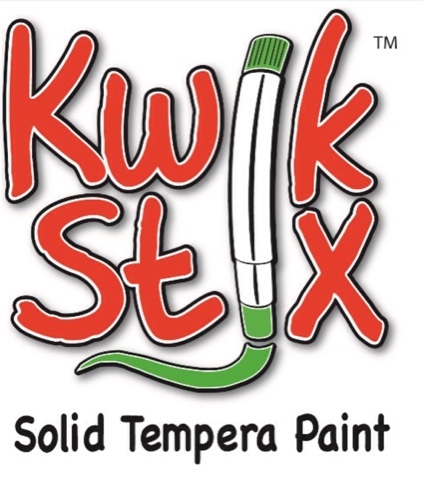 Thin Stix are the latest version of Kwik Stix from The Pencil Grip, Inc. redesigned with a thinner, longer tube and a smaller tip for better control. We compared this set of Thin Stix 6pk of Classic Colors with our original (and much used) Kwik Stix as we painted rocks for a Mother's Day gift. While the two sets have a lot in common, the Thin Stix worked perfectly for adding details to our design. The tubes easily twist up from the bottom like chapstick or glue sticks. I think this new longer thinner design is even better than the original Kwik Stix for smaller hands to grip. We have successfully created art projects before painting with Kwik Stix solid tempera paint sticks on paper and wood, so we wanted to try something just a bit different this time. (Another review crew friend suggested painting rocks. Click the link at the bottom of this post to see all the different ways crew friends used their Thin Stix.) The rocks were so much fun to paint, and Grandmommie loved her gifts. She added them to her earth box. It has been raining a lot here. 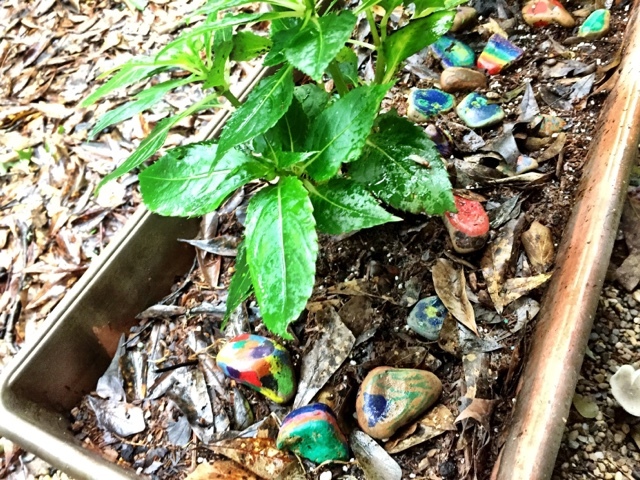 I was happy to discover that instead of washing away the color, our painted rocks are just as vivid after the rain. 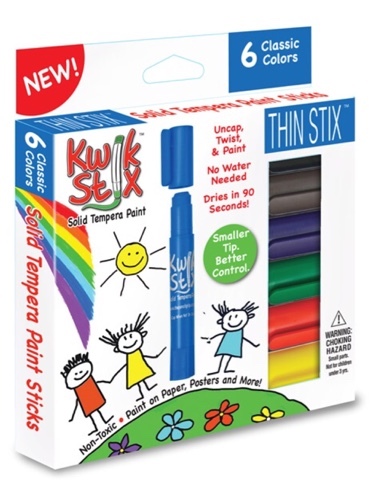 This Thin Stix six pack includes red, yellow, blue, green, brown, and black colored paints. A handy plastic tray is included for easy storage both in and out of the cardboard box which they came in. Since the solid tempera paint in the Thin Stix dries in just 90 seconds, colors can be layered on the painted projects. My daughters teach violin and piano lessons in our home, and occasionally their students' siblings visit during the lessons. I set out the Kwik Stix on our back porch while they visited last week, and kids joined me happily painting rocks. We gathered gravel from our driveway, searching for rocks with at least one flat side to color. We discovered that it was easiest to add thicker layers of color to hot rocks as the paint glided, actually the paint almost melted onto the hot surface as we colored. This was so much easier than using paint brushes! Hooray for non drippy less messy Kwik Stix Thin Stix! Organization is a constant goal at our house, and there always seem to be messes to tackle. I appreciate this method of painting without the typical spilled water and dripping paintbrushes that accompany traditional painting. Vacation Bible School is happening soon at our church. Thin Stix will be just right for using with the three and four year old class. Our theme is Galactic Starveyers, so painting space rocks might just be one of their craft activities. I hope the Pencil Grip company adds all of their Kwik Stix colors in this thin version. 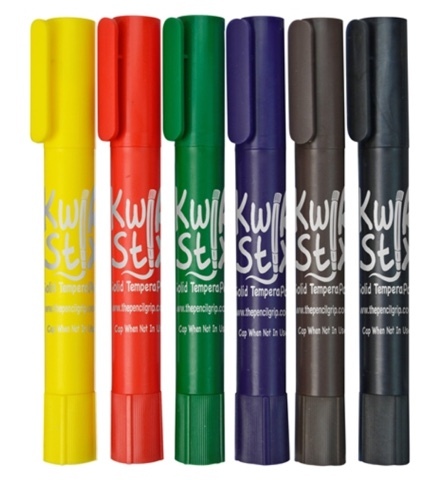 The Pencil Grip, Inc. has many products in addition to their Kwik Stix line. I have recommended the unique pencil grip for years as one of the most comfortable options to facilitate a proper pencil grip. They also have weighted therapeutic toys and a weighted pen which includes a built in pencil grip on its barrel.